Finely crush the rest of the cookies in a blender or food processor. If using a food processor, add the cream cheese in large chunks and pulse a few times to until the candy consistency is that of dough. If you don’t have a food processor, stir together the softened cream cheese and crumbs until the candy is well-mixed. Place the candy in the refrigerator to firm up for about 1 hour. Using a teaspoon or candy scoop, form 1-inch balls and roll between your hands until they are round. Place the candies on the prepared baking sheet. Refrigerate them while you prepare the dipping chocolate and cookie topping. Place the chocolate in a microwave-safe bowl and microwave until melted, stirring after every minute. Allow the chocolate to cool slightly, but do not let it harden. Dip the candy balls in the melted chocolate and place on the foil-lined baking sheet. While the chocolate is still wet, top each with a sliver of cookie. 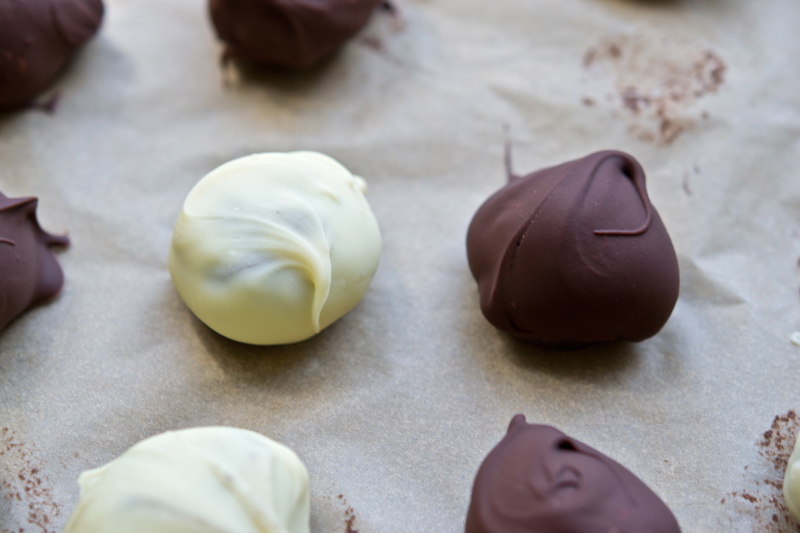 Repeat with remaining truffles, and refrigerate for 1 hour or until chocolate has hardened.